Lovely! My wife and I were just discussing the possibility of spending Christmas in Los Angeles where we could see the Camelia Garden at the Huntington Library. I realize you’d probably fly, but my first thought was, “Run, don’t walk to get there.” I visited the gardens at Huntington last year and it is beautiful. The Camellia walk is lovely and I especially enjoyed the Japanese garden. I’m not a huge fan of rose gardens but their’s was wonderful. 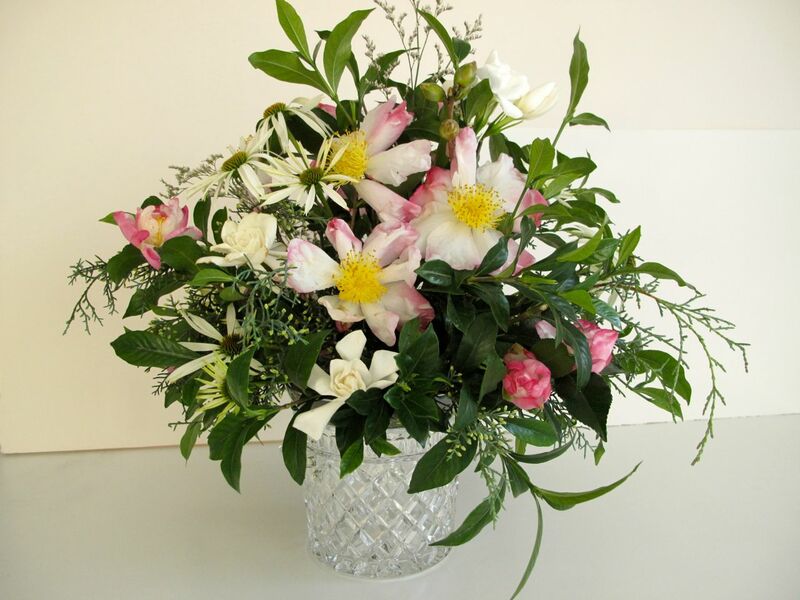 Susie what a stunning vase…formal with amazing flowers and foliage….I am enchanted with this arrangement. Wish I had those flowers still going. Many thanks Donna! I’m savoring these special blossoms. This week seems to have made everyone look for different flowers. Yours is a wonderful combination. Gardenia and camellia look wonderful together even though I think of them as flowers from different seasons. 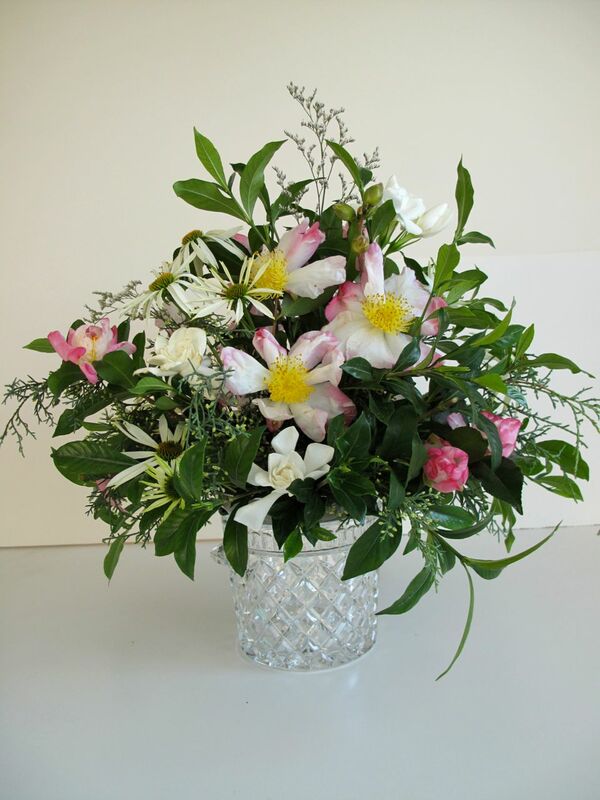 Crystal is the perfect choice for these flowers Susie, this is definitely one of my favorites of your arrangements. Thank you Christina. Part of what makes this fun is finding the slightly unexpected. I thought about just floating a couple of sasanqua blossoms in a shallow dish, but discovering the gardenia pushed me to do more. Lovely, Susie. Is the camellia ‘Hana Jiman?’ I had one in our Chapel Hill garden and it always was a floriferous winner. Thanks for the name of the camellia John. A woman who works for a garden center in Raleigh came across my sasanqua post last year and suggested it might be ‘Hana Jiman’. I forgot to look it up yesterday. This one does bloom well. I bought it at Southern States years ago before I started trying to remember the cultivars, so don’t know for sure. It has a wonderful scent. Exquisite. I love your blog. Thanks Ann–it’s mutual. I don’t work with fabric, but admire your creations. Lovely arrangement Susie, how wonderful to have Gardenias flowering, the perfume must have been wonderful. Having both the sasanqua and the gardenia scents to enjoy together made me almost giddy. Flowers can do that. Looks like summer! 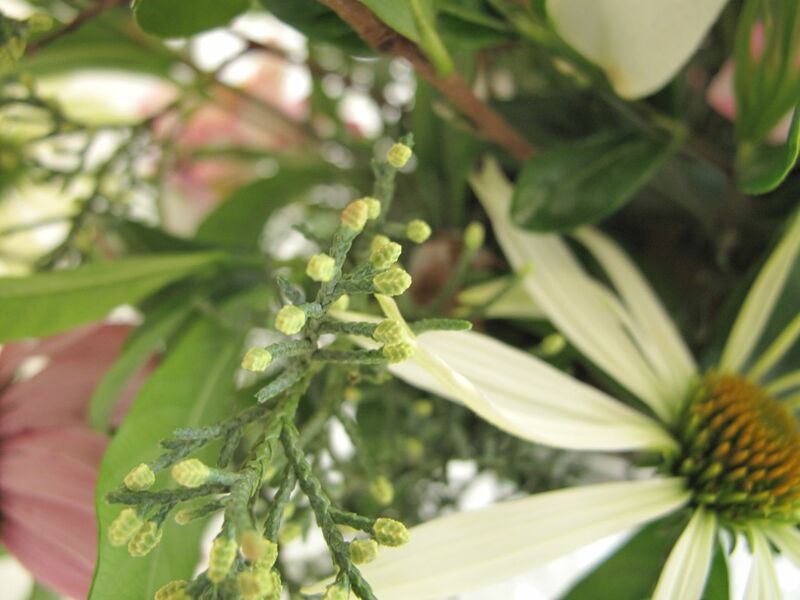 The camellias are of course wonderful, but I also love the gardenia foliage and the white Echinacea. Does it usually flower so long for you? Sprigs of cypress are also a great idea. I admire the shape of your arrangement Susie. Mine was a bit “plonked” this week! Cathy, I was planning to “plonk” this week too and just float a few camellias in a shallow dish, but finding the gardenias made me change direction. The white Echinacea did not do well last year but made a comeback this year. I feel it’s an unusually long autumn season this year, with pretty decent amounts of rain, and that has given the Echinacea and some other things time to flower under less stressful conditions. Have a good week. 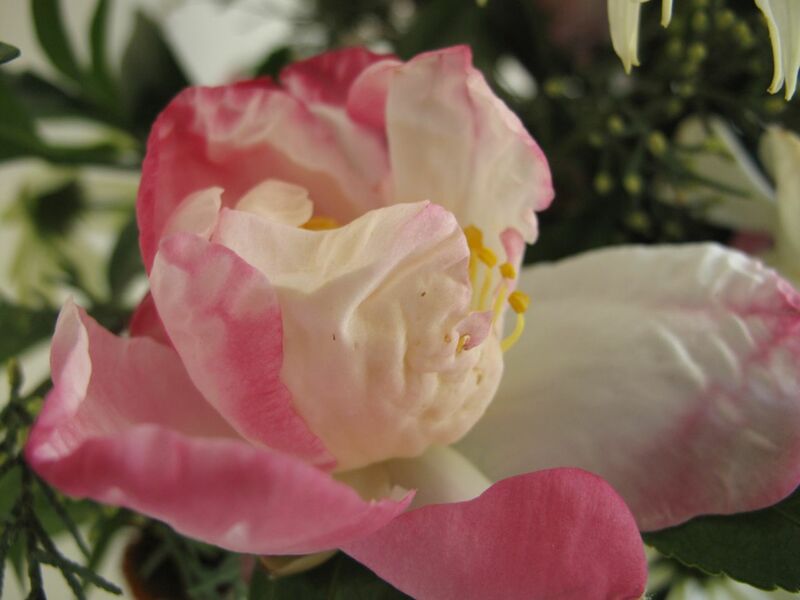 Wow – that camellia was not what I was expecting – it looks so like a rose in these pictures and I wouldn’t have known unless I looked at the leaves I suppose. The gardenia is gorgeous too and I still have to admit I have never knowingly smelt one! 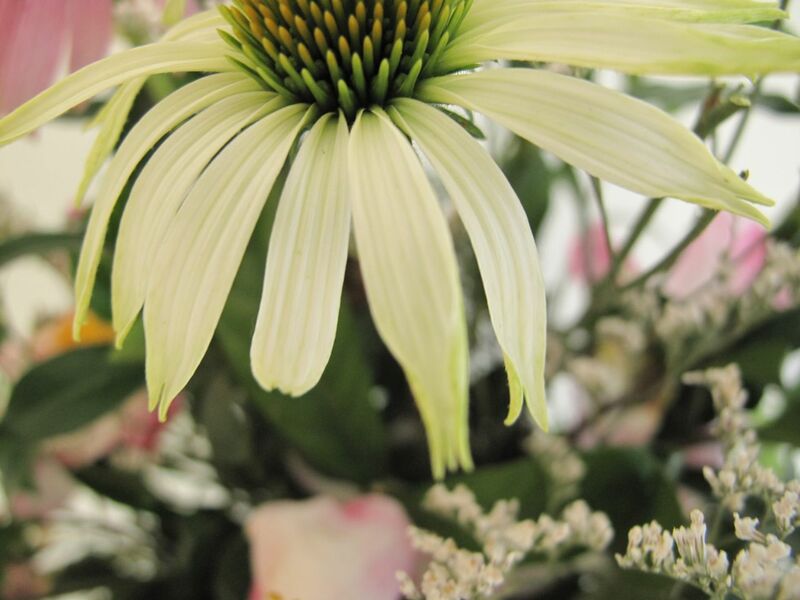 The echinacea was an inspired addition as, with the evergreen foliage, it sets the main blooms off perfectly. Very lovely, Susie – thanks for sharing! Thanks very much Cathy. This is my favorite of the 3 camellias in my garden. I admit I had to add the echinacea because I didn’t have enough stems of camellia and gardenia to complete the arrangement, but it seemed to make a good companion. Looking forward to your anniversary posting. I’ll have to look back and see when I first joined in. Thank you Judy. The container is special. I don’t really remember my aunt using that vase but still I sentimentally associate it with her. Nice gentle colours, and love White Swan! Thanks Malc. Yes, White Swan is nice and elegant. 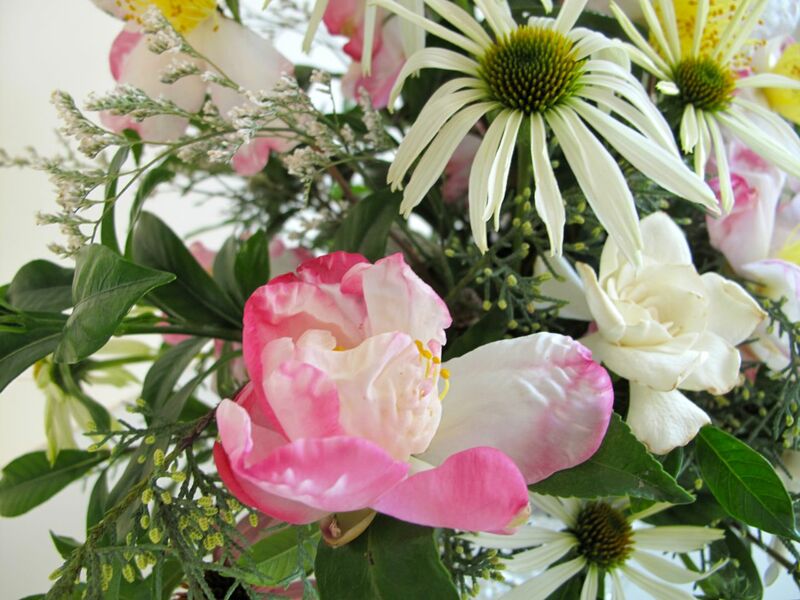 Hi Susie, your arrangement is really accomplished and professional, its just beautiful. 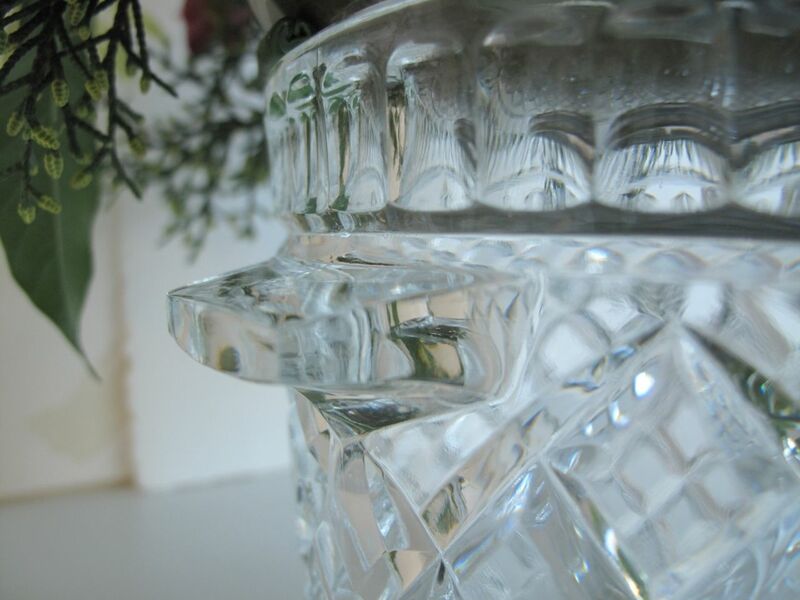 And your Aunts crystal vase the perfect foil for your gorgeous flowers. 🙂 PS Lovely photos too! Oh, I appreciate your generous comments Julie! You do realize I’m only showing you the “good side”? Thanks so much. What a nice arrangement, I’m sure there would be no shortage of people willing to take it home to become their own table’s centerpiece. I am a little jealous of the camellias and gardenias. To have both at once is a real treat! Thanks! Having both camellias and gardenias does seem like a windfall. Every time I enter the room where they sit, their fragrances greet me. I really love this one….so graceful. Something about the arrangement that looks very romantic. Thank you. Perhaps the soft colors lend a bit of romance. I certainly enjoyed working with these flowers, but sadly by Wed. evening, they’re not holding up very well. The scent is so nice still I’m leaving them a while longer. How beautiful and such exquisite flowers. 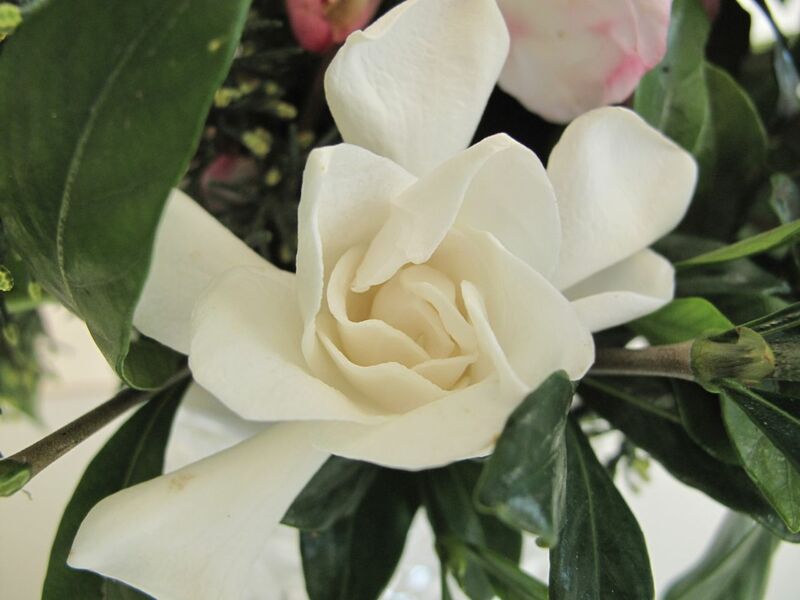 I love the Camellia and having Gardenia to pick is very special.It must be a joy having this in the room. Your arrangements always look so professional. Liz, thanks for the nice comments. 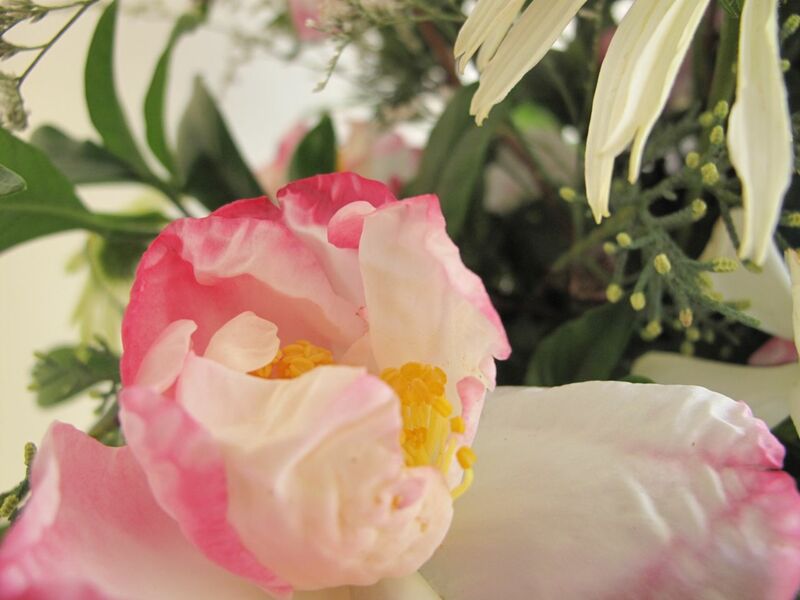 This arrangement has a heavenly scent, but sadly the flowers are not long-lasting. I love the color combinations and the shapes…So pleasing to the eye. Thanks so much Charlie. Finding the gardenias to accompany the camellia was quite nice. Sadly, this arrangement didn’t last very well, but I’m more hopeful for this week’s. Hope you’ve been having a nice autumn across the continent. 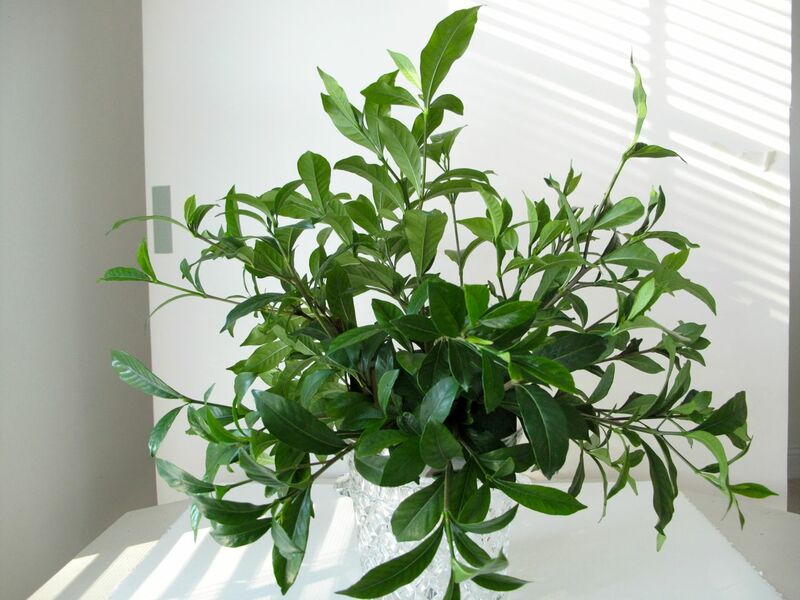 Is there any chance you know which Camellia sasanqua that is? It’s gorgeous. I don’t have a tag for this camellia but a couple of people have suggested it is ‘Hana Jiman’. When I looked it up I thought it certainly is a good match, but can’t know for sure. This has a lovely fragrance.